Our range of products include hydraulic four column press, closed frame hydraulic press, h frame hydraulic press, trimming press, hydraulic trimming press and c frame hydraulic press. 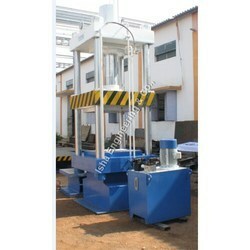 Hydraulic Four Column Press is a simple machine with many uses. It is used to lift heavy objects like cars and machine parts up in the air. It is used to compress hay, cotton, cardboard and other materials into bales for easy transportation and storage. It is used to shape metal parts for various industrial uses. Closed Frame Hydraulic Press offered are developed using latest technology support and feature use of PLC control with digital operator interface that allows for easy and accurate control of involved operations. Also meeting the demands of safety & operation regulations, these close frame hydraulic presses also come with advanced heavy duty industrial design with minimal deflection and overload protection support. Some of its features include offering full tonnage throughout stroke/cycle, available with choice of optional accessories like light curtains, pressure strips, remote diagnostics, die tables, local or centralized controls among others; providing for high production efficiency, coming with automatic in/out mold and ejector device, PLC programming control for easier operations among others. 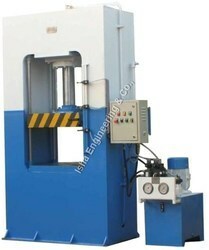 The H Frame Hydraulic Press offered by us are specially designed with low noise level and precise ram guides. These are durable, reliable, rust and corrosion resistant and have least possibility of leakage. Its capacity is up to 300 tons and it features lubrication free polymer bearings, die cushion, induction table and rubber molding with pressure transmitter for precise pressure sensing. It finds usage in powder compacting, valve pressure testing, rubber molding, plywood and lamination and in metal forming and deep drawing. We offer Trimming Press that is fabricated using quality raw material and is applicable in blanking, piercing, embossing, forming and trimming. Available in different capacities these are dimensionally precise and effectively operational these find usage in industries like automobile industries, ceramic and refractory industries, kitchen equipments, research centers and laboratories, rubber industry, pump industries, valve pressure testing and wood industries. We also provide customization as required by the client. Hydraulic Trimming Press, 40 Tons offered comes with semi-automatic and operation support and can be easily controlled through its advanced PLC control so as to ensure of maintaining efficient operations standards. Further the stress relieved rigid finish and lubrication free polymer bearings of these presses also make these deliver efficient performance. Some of its features include allowing for multi-operation in single stroke, finding application in industry areas like automobile Industries, ceramic and refractory industries, kitchen equipment, research centers and laboratories and others; comes with adjustment provision for working pressure and slide stroke, superior heat treated column and piston rod for extended service life among others. 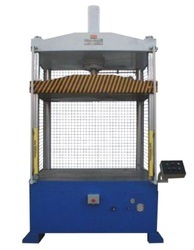 The C Frame Hydraulic Press its name from the shape of the frame. The primary advantages to the C-frame design are an open work area and increased accessibility. The C-frame press features become even more advantageous when multiple presses are used for progressive operations with automated material handling moving parts from press to press. 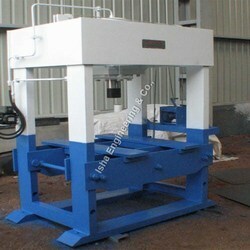 The C-Frame hydraulic presses, however, are generally limited in maximum tonnage due to the design.